Ghasemi, E., Ghahari, M. (2015). Synthesis of Silica Coated Magnetic Nanoparticles. International Journal of Nanoscience and Nanotechnology, 11(2), 133-137. E. Ghasemi; M. Ghahari. "Synthesis of Silica Coated Magnetic Nanoparticles". International Journal of Nanoscience and Nanotechnology, 11, 2, 2015, 133-137. Ghasemi, E., Ghahari, M. (2015). 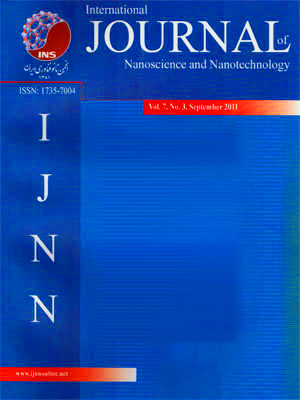 'Synthesis of Silica Coated Magnetic Nanoparticles', International Journal of Nanoscience and Nanotechnology, 11(2), pp. 133-137. Ghasemi, E., Ghahari, M. Synthesis of Silica Coated Magnetic Nanoparticles. International Journal of Nanoscience and Nanotechnology, 2015; 11(2): 133-137. In this research controlled coating of magnetite (Fe3O4) nanoparticles with SiO2 was investigated. The Fe3O4 nanoparticles were synthesized via chemical co-precipitation and then coated by silica according to Stober method. Effects of tetra ethyl ortho silicate (TEOS) concentration and ethanol to TEOS on the coating thickness were investigated. X-ray powder diffraction, Fourier transform infrared spectroscopy, transmission electron microscopy and alternative gradient force magnetometry techniques were used to characterize the magnetic nanoparticles and their coating. The results showed that the Fe3O4 particles are in the 6-20 nm size range. Particles coating thickness increased when the TEOS concentration increased. Magnetic results revealed that the coating can prevent magnetite nanoparticles from surface oxidation and enhancement of saturation magnetization. For magnetic particles with mean diameter of 15nm coating diameter was about 7nm and the saturation magnetization of such particles was about 30emu/g.